Take this with a reasonably sized grain of salt, but Sky News Entertainment reporter Joe Michalczuk says that Star Trek movie co-writer and producer Roberto Orci has discussed bringing the franchise back to TV with CBS. On the other hand, Michalczuk says Orci told him this directly, which is much better than coming from an unnamed source on WeHeartTrekMovees.net or something similar. If this does happen — and based on the current success of genre shows like Agents of S.H.I.E.L.D. and Sleepy Hollow, I think the odds are in its favor — I wonder what it would be? 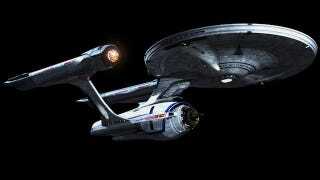 Would they recast Kirk and crew to follow the adventures of the original Starship Enterprise? Would it star an all-new crew in the same time period? Would they — gasp! — do something in the original continuity?! No, probably not. But no matter what, it'd be nice to have Trek back on TV again.